Do you have a loved one who is sexually addicted? Do you wish you could visit with a couple who has faced this challenge and survived? This book is your chance to do that. Help for those with sexual addiction in the LDS community is becoming available in the form of recovery support groups and materials written from an LDS perspective. Sadly, help for their loved ones has been slower in coming forth. 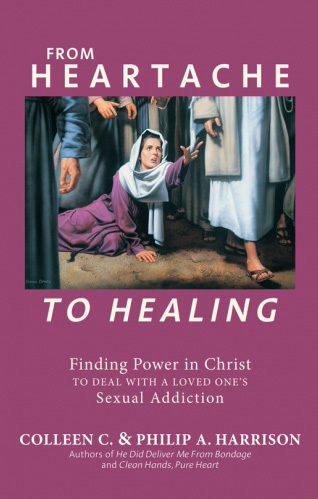 In From Heartache to Healing, Colleen and Phil Harrison offer compassion, understanding, and help as they share the principles and insights that helped them find the Savior’s grace and guidance to face and survive the heartache of sexual addiction. Colleen and Phil share concrete advice in dealing with a most heartbreaking situation. There is hope for healing, through the Power in Jesus Christ. Colleen shares inspiring wisdom from a wife’s perspective; Phil’s testimony, as a man who has been clean from sexual addiction for over ten years, will bless you as well. Their combined testimony is that you can also find peace and healing through the Savior’s offer of atonement. Phil Harrison struggled with addiction for over 30 years. After his first wife, Kathy, passed away, he married Colleen less than a year after getting into a 12 Step recovery program. Colleen had previously been married to another sexually addicted man, but one who did not seek help or recovery, and ended up going to prison because of his indulgence in his addiction. When Colleen and Phil became acquainted, Colleen had been divorced from her first husband for several years. Based on their experiences—Phil’s with addiction and recovery, and Colleen’s with marriage to two different men with different approaches to their sexual addiction—the authors share from a wealth of experience concerning what does and doesn’t work.